Ownership or the executive team at any company should always strive to make their company better. There should be an ongoing effort to improve products, services, or business processes. The management team should focus on increasing the effectiveness and/or efficiency of the organization to fulfil its policy and objectives. Improvement in business strategy, business results, customer, employee and supplier relationships can be subject to continual improvement. Every effort should be made to make the company better. Continuous improvement may come in many forms or management systems. You hear reference to business process management, quality management, project management or program management. Most systems are complex and expensive. So many executives, especially in smaller companies, tend to avoid expenditures in these area. There is a tendency to rely on labor intensive manual processes in over 70% of manufacturing companies today. 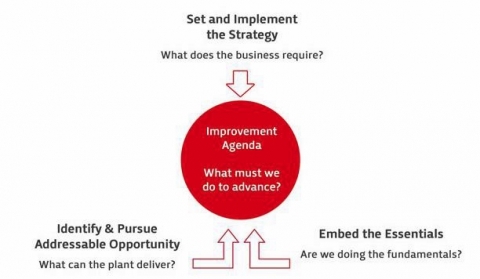 I recall a 4/28/2014 Industry week article, written by Roger Price, where he discusses the three areas that are essential to continuous improvement in the organization. This is good advice, but it requires a top down approach within the organization to make it work. The plant floor and the operations staff usually get it. Operations is usually driven to finding better ways to make things better, faster and less expensive. Resistance usually come from Finance types that are focused solely on the bottom line now and not long term growth. Finance needs to verify the benefits over time and not get intimately involved in day to day to day operations. To support continuous improvement, businesses should continually examine their business processes to discover and eliminate problems. Typically, they accomplish this by making small changes rather than implementing a large-scale alteration. By focusing on making things better without finding blame, project teams take actions to reduce defects, remove activities which provide no value and improve customer satisfaction. In companies utilizing manual processes for quality management, most quality managers realize the benefits of automating these processes. They will evaluate software and systems. Many times without a budget in mind or the go ahead from the management team. Quality managers in many organizations tend to get caught up in all the “bells and whistles” of products that they evaluate for quality management. Many forget that the goal of acquiring a quality management system is to reduce waste, improve product quality, reduce rework time, faster response time to customer orders, become more competitive by driving down costs and to comply with more and more government regulations. For a Continuous Improvement Program to work effectively, you must have management commitment. That would be a senior executive who can set priorities, commit resources, break down barriers, overcome resistance and is committed to improving profitability. You will require focused resources or employees formally trained as internal experts in full-time roles focused on applying tools and strategies to one or two high-priority projects. There must be training to develop common language, knowledge, tools and problem-solving approaches throughout the organization. You will require a disciplined project approach with regular project reviews conducted with process owners and senior management. And finally the bottom-line financial impact of every project must be measured and reported to senior management. Keep in mind that the finance types will be looking for the shortest “Return on Investment” with every project. The Harrington Group has sold software for business process improvement and quality management to over 45,000 businesses worldwide since our founding in 1991. Quality management software is an integral part of the continuous improvement process. We take a simple approach to addressing continuous improvement within any organization. The Harrington Quality Management System (HQMS) provides a formal structure with accountability to identify specific problems, assign a team to define and describe the problem, develop an intermittent containment plan, determine the root cause, implement and document your corrective actions, and take preventive measures to ensure the problem will not happen again. You will find that additional applications within the software allow for a repository for corporate documents and their control, managing internal and external audits, document non-conformances, managing internal employee training, managing assets and parts, managing customers and more importantly managing your suppliers. A software solution for managing product quality can be very cost effective. The finance types will be looking for a short return on investment. The simple solution is to show a reduction in overhead expenses, increased revenue and market share, and the ability to flexible and fast responses to market opportunities. HGI can assist you with justifying a system. So if you are thinking about a continuous improvement process to foster long term growth within your organization, we can help. Email me at eniemiec@hgint.com or call me directly at (407) 781-0854.